The following PrizeRebel review offers detailed information about the website from how it works to the rewards you can earn. In addition, we will touch on the benefits as well as some of the not-so-good aspects about the website. This PrizeRebel review will further address some common concerns users have brought up about the website. These concerns include issues getting credited for completed tasks and trouble accessing surveys. 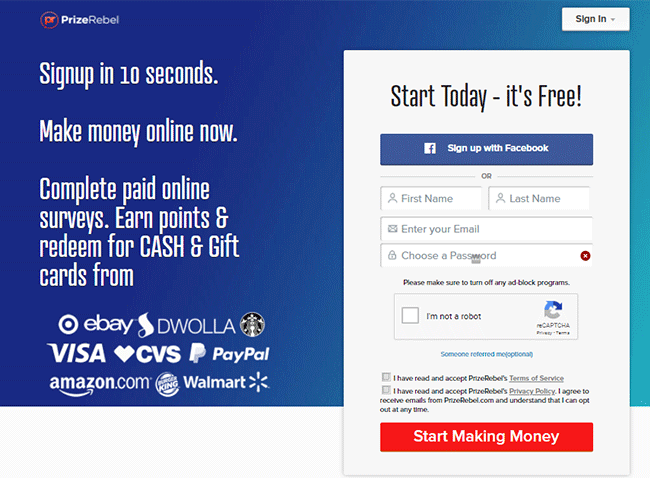 PrizeRebel, active since around 2007, is a GPT (get-paid-to) website in which users can earn rewards for completing an assortment of online activities. It is similar to other GPT websites such as SwagBucks. Is PrizeRebel Legit or a Scam? Rest assured, PrizeRebel is a legitimate GPT website. The company offers numerous types of rewards that users can actually redeem. You don’t have to put any money down to sign up and start earning either. Paid Surveys: You can take online surveys and receive rewards once they’re successfully completed. Fill-out Offers: There are several offers you can fill out to earn rewards. Some require you to spend money, but these are optional. Offers include signing up for a trial period, joining a mailing list online, and more. Complete Tasks: Tasks are simple online jobs that include things such as internet searches, examining various websites for citation errors, etc. Contests, Raffles, and Games: You can participate in various contests, raffles, or play video games in order to earn rewards. Contests include filling out the most surveys, completing the most tasks, etc. When it comes to the games, you sometimes have to download and play once, or you have to reach a certain level in-game to earn the rewards. Daily Challenge: There’s a challenge every day you log in that you can earn rewards from. Watch Videos: You can watch short videos to earn rewards. However, you may have to watch a certain amount of videos before you can earn anything. Accounts on PrizeRebel work on levels. As you move up higher, you’re granted additional benefits, which offer you additional ways you can earn rewards. On PrizeRebel, you can earn rewards by referring people to sign up and participate in the website. PrizeRebel has a number of different rewards that members can choose from. Gift Cards: With 500+ gift cards available, it is evident that transferring points to gift cards is a popular choice for members. Granted, you may be limited by what you can select based on your region. Cash Payout: You can request that your points transfer into cash to receive a payout. The minimum amount you can request is $5, and you can have this paid out to either PayPal or via direct deposit to your bank. Raffle and Lottery Jackpot: If you wish, you can transfer some of your points into the raffle or lottery for a chance to win substantial cash prizes. As stated earlier, this PrizeRebel review will take a look at the good and bad sides of the company. This way, you have a well-rounded view of PrizeRebel to make a decision as to whether or not it is the right website for you to sign up for. Various rewards: One of the biggest advantages PrizeRebel has is that it offers members a number of different rewards. There are hundreds of gift cards to choose from, and you can even request cash through PayPal or your bank. Multiple ways to earn: A surefire way to keep the attention of members is to have a multitude of ways to earn rewards. With PrizeRebel, you are not stuck doing one or two tasks. Rather, there are dozens of things to do from surveys, to watching videos, and even playing video games. User-friendly interface: PrizeRebel has a simple layout that even those new to GPT websites can readily learn to navigate with ease. Long process: Even though there are many tasks to do on PrizeRebel, earning anything worthwhile can take some time. In particular, it takes time with the surveys as you can start a good number of them before being kicked out as you don’t qualify. User concerns were touched on earlier in this PrizeRebel review. One thing some users have pointed out is that they did not receive credit for tasks they completed. There is also the complaint that time is wasted filling out most of a survey only for it to boot them with no rewards because they didn’t completely qualify. To be eligible for more surveys, you can update your profile so that it’s more detailed and fleshed-out. You can also see more benefits as you move up a level. As for the not receiving rewards, it is best to contact support or reach out to social media to see the responses from others in your situation. Contact Form: You can fill out their brief Contact Form to reach out to a PrizeRebel representative. Social Media: PrizeRebel is found on Facebook, Twitter, Instagram, Google+, and Pinterest. To wrap up this PrizeRebel review, this GPT website is like many its class. You can earn points by completing various tasks, and you can transfer these points into rewards such as gift cards and cash. Though there are concerns with how long it can take to earn anything as well as getting locked out of surveys, users generally have good things to say about the website. Have you tried PrizeRebel out yet? If so, feel free to share your experiences with us in the comments.